Once again I was allowed to take part in the recording of an episode of the NerdZoom Podcast, which hopefully is an entertaining and informative listening if you care about nerdism and Linux on smartphones. Big thanks to Marius and Max for having me! Also, on the 11th of November I launched a podcast with my brother called “Schnapszahlbrothers”1, which will have 11 episodes in total (for this first season), being released on the 11th and 22nd of each month. Unfortunately, both formats are recorded in german language. But I might… no, no spoilers. Radek Polak shot a nice video of his distribution QtMoko, which is essentially a Debian based distribution based on Qt Extended (Qtopia), originally developed for the Openmoko Freerunner, running on the GTA04. Today I found this in my inbox. Openmokos next project will be a web application called shiftd.com which actually seems quite nice to me. It still has some glitches, and I can’t tell whether it will take off – but it’s a nice idea. in the past. No circuit boards were printed. Steel tooling wasn’t cut. tools left us deeply unsatisfied. So we set out to build our own. our perspective with you at the earliest possible stage. the beginning – the time at which we know the least about the project. while still maintaining our original vision. intimately grow Shiftd into something great. LiMo R4 announced, devices to come? When LiMo 3 was released, nobody was really excited – it was last year in february, and at that time Intel and Nokia got all the attention for their MeeGo announcement, and besides that, Android was becoming huge at that time. Now, with MeeGo being pretty much dead in the handheld / smartphone form factor, this may change. While there wasn´t much reaction on the announcement of LiMo 4 during MWC this might change as soon as devices will be out (there is not a single LiMo 3 device available in Europe, btw). When you look at the LiMo platform architecture overview, and you know what this looked like before, you notice that there is a new UI stack: EFL – Enlightenment Foundation Librarys. In fact, this is a contribution by Samsung, who hired Carsten Haitzler, BDFL of this project, a while ago. Samsung is putting real resources behind EFL and using it to make a production-ready OS. The OS not only is Linux based, It uses all the other infrastructure from Linux (DBus, Glibc, Xorg, and much much much more). It is also going to be Open Source (GPL, LGPL etc.) and with Opensource upstream gaining contributions back from Samsung. This is a real effort and not just some research experiment. Stay tuned. Things will only improve from here. If you were hoping for a slew of MeeGo handsets, then maybe you should also keep an eye out for something from Samsung (actual product details not available yet – if it be a tablet, handset or TV or anything else for that matter). Many of you will ask: Why LiMo? This question has to be asked, I totally agree. The great thing about LiMo is that it builds on “real GNU/Linux” – Android doesn´t, it just uses the kernel and some more small parts, but it has it´s own framebuffer UI stack (no X), its own C library “bionic” (no (e)glibc) and so on. Still, opensource people haven´t been exactly exited about LiMo – LiMo phones aren´t hackable (LiMo2 phones like the Samsung GT-i8320 (sold as Vodafone 360 H1 in Europe) have non writeable rootfs (cramfs) and locked bootloaders, and there were open alternatives like Openmoko. With Openmoko no more in the smartphone market, and it´s dated at release hardware aging even more, this issue is partly solved – while contribution and hacking on LiMo still will be difficult with LiMo being a middleware and an IP pool. Consumers didn´t really like LiMo phones, either – LiMo based deviceslacked an ecosystem in the past, there were few native applications and no free SDK. But these issues are addressable, and with EFL, next generation LiMo based phones will have a blazing fast UI which certainly will be fascinating, and feel more fluid than comparable Android devices. There might be a comeback. After having decided to reactivate linmob (rebranded to LINMOB) I asked myself what would be a good first article, and there could be only one answer: Write about something that isn´t sprayed on the walls of every other tech blog / tech news site, and it would be great if that would fit to past linmob articles. Luckily I then remembered the GTA04 project (gta04.org) which is building replacement boards for Openmoko´s FreeRunner / Neo1973 phones. The company behind this thing is well known in the german Openmoko community – Golden Delicious Computers / handheld-linux.com – they were not only official Openmoko distributor, but they later offered Buzz- and Bass-fixes. So, what will we find on these boards? What remains yet unknown is the amount of RAM and Flash memory – I hope it will be were it is supposed to be in 2011 – it should be 512MB Ram and at least the same amount of ROM/Flash memory. It should be possible to add in a 1.3 MPixel camera. What remains is the same 2.8 inch 285dpi VGA screen with resistive touchscreen and the same case – to things that make this upgrade board a lot less interesting for the average user. But let´s rather talk about the advantages, which is openess. In times where companies like Motorola or Sony Ericsson lock down the bootloaders of their smartphones which makes hacking them (even though they run Android and thus a Linux kernel (looking way back at Motorola EZX/MAGX phones you understand that this is not an Android issue – a Linux kernel does not imply that your phone is hackable), a phone with an open bootloader, embraced by the Open Source community can be a strong solution. By the way: The GTA04 root is the Openmoko Beagle Hybrid and there are plans for even more advanced devices – of course development costs money – I doubt this will go on without a certain amount of sales. For further information head over to the already mentioned gta04.org website, to the GTA04 article of the Openmoko.org wiki, to handheld-linux.com or check out the Openmoko Community Mailinglist. If you speak german (or can live with Google translation) make sure to have a look at freeyourphone.de. So why am I writing this? Actually I ask myself whether I really need all these devices. During the last weeks, I just used the HP 6715b just as a video playing device, meaning I used it to watch TV or DVDs, as it has a great screen and better than average speakers. I didn´t really use it as a computer besides for short websurfing sessions – since I´ve got my new netbook, or better since I am used to my netbooks keyboard, I ´ve found myself using the netbook for websurfing and office work – I really love that thing, especially since I managed to make Linux work on it just perfectly. Yeah, I have to admit it: I am set to sell the HP 6715b again, which I bought used in december. While it is a nice device, I do not like the keyboard that much (it is ok, but worse than the keyboard of my previous notebook (HP Compaq nx6325) – and Linux does not run that well. While I managed to silence the roaring fans (I cleaned them and replaced the heat paste), I have no idea how to fix the really bad USB performance of the device – I don´ t think this is a hardware issue, as USB performance is ok in Vista (which I find horrible, otherwise). So it is very likely that I will sell this notebook pretty soon. But what will I do then? Living without a notebook, just with my Eee PC as only computing device? Actually though I really like my 1001P, I doubt that I will do that, just because of the screen size: 10.1 inch is not the screen resolution you want to work with for several hours. Besides: I am not really sure whether the Atoms performance is really enough for me. It might very well be, but I have my doubts. Then I´ve got this old, 2008 VIA powered netbook, which is, as you might imagine, pretty slow – and 7 inch is really small. I don´t know what to do with that one. I most likely won´t make much money by selling it, and as I kind of like it (and still have parts I wanted to solder into it once), I might finally apply the touchscreen mod and use it as music player (or even to create music using software synthesizers) or WLan router / home server. While I really love my HTC Dream (even though it could be slimmer, have a better camera and .. well, it could be a Milestone, you know ;-) ), I don´ t know what to do with that Openmoko FreeRunner. 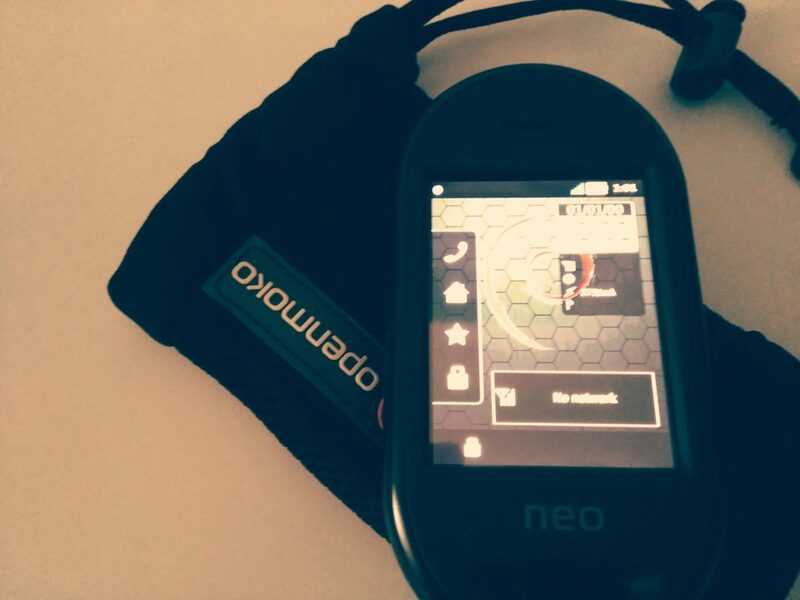 It is a nice device, and I got to be able to try out the various flavours of mobile linux distributions (like Hackable:1, QtMoko, and SHR), and back then the Openmoko world was different, as GTA03/3D7K, meant as a follow up to the FreeRunner was not cancelled yet. Buying a broken FreeRunner to fix it was a start into the world of Free Software telephony – on an open device. Today I have to admit that I barely use the Freerunner. It feels nice and solid when you hold in your hand, but as standby times are short and phone calls work, but still could work better and standby battery life is rather dissapointing (I didn´t apply the #1024 bug fix yet) I rather use my Motorola A910 for my secondary SIM, which runs Linux as well (though the rest of the software is rather proprietary). If I really wanted to use this phone, I would have to sell my HTC Dream (without getting a “milestony” replacement) – because right now I have no real use case for that one besides trying out some distributions every quarter. Now that is what I´ve got. What to change? (Suggestions welcome!) Part 2 will be about options. A replacement board for Openmoko featuring more processing power? Possibly. existing GTA02”. And yeah, UMTS is there and it is supposed to deliver “roughly the power of a Beagle board”. While this is not as interesting as another open phone would be (replacing the small GTA02 screen with its even smaller finger touchable area, this still sounds pretty cool. BTW: The same ML posting contains some information regarding good old dead GTA03. P.S. : If you are looking for the FOSDEM slides mentioned, get them there. Motorola Droid is actually able to be a USB Host. Of course you need a special cable to use your Droid even more like a computer thanks to this feature – but hey, it´s great anyway, thanks to Chris Paget for the cable guide, and Mike Kershaw and Mike Baker, who are Kismet/OpenWRT hackers, for the hacking. As soon as it is confirmed that the GSM-Droid, the Milestone is USB OTG capable as well, I will be tempted to replace my OpenMoko FreeRunner and T-Mobile G1 by a “Milestone”..
Openmokos Project B is out, in fact it is since tuesday. 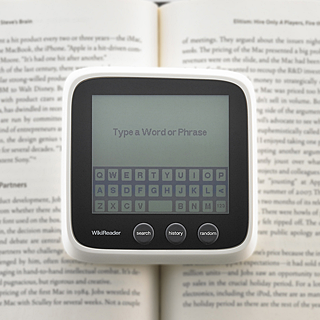 It is a WikiReader, a device you use to read Wikipedia articles on it. Looking at the reception of device, it´ s been overall mixed. Technology enthusiasts were often sceptical, arguing that they would not need such a device, being able to read the Wikipedia everywhere on their smartphone – and of course they are right, they might not need it, but the question is whether tech enthusiasts are the targeted audience of this rather simple device. In fact have to say that I don´ t think they are not, and thus I have to conclude that I am not the kind of guy this device is aimed at. Nontheless I like the device – on the one hand I always like highly integrated device, being a fan of mobile computing – but as much as I like those feature monsters, I like simplicity. The WikiReader appeals to me, because it is so dead simple (well, if it is, I can´ t say yet, as I didn´ t order one yet – I will once it is available in europe). Now what do I like about this device? First of all, I like the design, which I´d call beautiful – if the build quality is reasonable, this device appears to be charming. I like the fact that the device uses microSD as storage – there is no USB connector, just the microSD – so upgrades will be a matter of being able to cut and paste. AAA batterys seem to be a good choice to me as well, as the device has to be very power efficent – they state that it might last for a year on these, figuring a 15 minutes daily usage. This is great, because todays feature monsters always need the wall charger when you need them to look something up. And last but not least: I love the fact that the device has no wireless connectivity. Guessing I have to explain this, I will just try to – and I have to start with my T-Mobile G1 (HTC Dream), which is a device certainly much more capable than this little WikiReader. But even though I love it´s connectivity options, I have to state that from time to time they really annoy me, exspecially since I have been using FBReaderJ to read some ebooks grabbed at feedbooks – always when I happen to read a really thrilling part of a novell, someone happens to call me, or the LED starts blinking because I got some new mail. Or, what might happen as well, I might get distracted by feeling urged to write a mail, Google this or that.. Besides of receiving phonecalls, interruptions like this won´ t happen using a simple device like the WikiReader – but you can switch your phone off (I could as well… ;) ). I could go on like this for ages, pointing out that I like the advertising and the design of the WikiReader website – but I don´t think that this would be worth reading. And by the way: According to WikiReaders twitter account, Amazon is already sold out of WikiReaders – assuming they had more than, say 20 in stock, this sounds like the beginning of a good story. Being sold and developed by a company which has the word “open” in its name, you can grab the sources here. “Brimborium” is a German word that can be loosely translated to “something with no meaning or value”.